Just got these two Nivea lip things for free! They are normally $3. But are on sale for $1 at Rite Aid. I have a coupon for $2 off 2 so, they were FREE! I love getting things for Free and will be posting more of my finds! If you have any free finds, send them my way too! I had a very long week (last week) & weekend. My children were out of school last week because of Winter Break, in which I totally don't agree with by the way. We took our children to Tennessee to spend time with my grandmother for the week. She wanted to see them. So all week, the hubby and I were alone. I did get some good sleep and was able to get some things done around the house. Well last week, I got a new job! I have been hired as a designer for an Atlanta based magazine that focuses on Businesses, Fashion, Travel, and Restaurants. I met with the creator of the magazine last Tuesday and was hired after the interview! This must be the week of first because I have a few other friends starting new jobs or new things. I actually start tomorrow. The cool part about the job is that I will be able to design from home and go in the office when I need to. I will be able to be apart of the entire production of the magazine and not just the graphic design aspect. The magazine is multicultural and I look forward to all the great things that could come from this experience! OK! Back to my weekend. Thursday night, my husband and I had a business meeting and didn't get home until around 11pm. We got up and I took him to work (he left his car at work the night before) and I went to my first interview/photo shoot with the magazine I now work with. After that, I drove to Tennessee with my mother to pick up my babies! They were so happy to see me! I jumped high and so did they! We ended up spending the night because my granny wanted me to take her around shopping and spend the night. So Saturday morning, we went out to breakfast and back to Georgia. My children had a birthday party to attend at 2pm and then family movie night at my church at 5pm. We watched The Ruby Bridges Story, which was a good discussion movie. 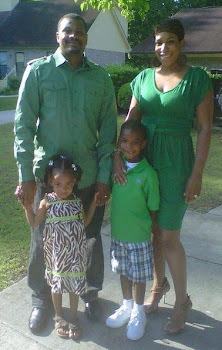 My children's Godparents watched them as we went to a surprise party for a client of my husband around 8pm. That was actually fun too because my husband doesn't dance and I will get on the floor in a quick minute. He saw that I really wanted to dance and everyone was coupled up, so he grabbed me and gave me 3 songs. That was so sweet of him. After we picked up our children and made it home for bath and bed it was after midnight! Sunday, after church we went to grab a bite and I was off to my Mocha Mom general business meeting. I took my daughter with me so my husband and son could do some yard work. After the meeting, we went to the grocery store and my daughter couldn't make it to the bathroom in time and ended up using the bathroom on herself right in front of the toilet. We both were standing there looking at each other. I was able to get her home and cleaned up, and proceeded to braid her hair for the week. I cooked shrimp & scallop pasta with sauteed mushrooms and tomatoes in a cheese Alfredo sauce. It was GOOOOD! Then I unpacked all our bags, put up the clean clothes and ......................... that's enough. I am tired just writing this. My husband was doing whatever it was he was doing. I was just focused on my household goals because I knew this week is going to be an adjustment for me. Where would you be TODAY if you didn't have children? What if you didn't have children and it's still February 24, 2011, where would you be today? Would you still be married to your husband? Would you still be living where you are living, working where you are working? Would you have a different passion or dream? Or would your life be exactly the same? This post is not to say you regret having children. I am sure we all LOVE our children and feel blessed that we are mothers, but I am asking a "What If ?" question. What if you didn't have the little bundles of joy, would your life be that different? I know my life would be different. I had a cross road in my college life where I changed my major my sophomore year. I was originally a Communications major because I wanted to be on TV. I wanted to be in broadcasting. And honestly, I still do. I did some bad research on pay and thought they don't get paid diddly squat and changed my major to Marketing. I wanted to change it to Advertising but my college, Alabama State University, didn't have Advertising. I regret changing my major, because I know better now and believe my life would have been completely different career wise. Don't get me wrong, I love marketing too. I am actually good at it. I even went beyond college and was educated in design and I am a certified Art Director. But in my heart, I still have a passion for the camera. And if I didn't have children, I would have followed that dream more. The good thing about life is that you can still follow your dreams, children or not, BUT being a good wife and good parent comes with sacrifices you don't think about before they come into the picture. Sometimes our dreams are delayed years, but if you have a supportive husband and strong desire to make them a reality - you can still definitely do what you so desire. Where would you be TODAY if you didn't have children? I guess, I would be working for a TV network and I would have traveled the world more. 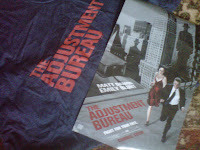 Last night my husband and I were given a chance to see an advanced screening of The Adjustment Bureau. It's the new movie starring Matt Damon, Emily Blunt and Anthony Mackie. The movie is being promoted by Liquid Soul Media. I had no idea what this movie was about but really just hoped it was going to be good. I am very glad we went because my husband and I both enjoyed the movie. From the consensus of the theater, so did everyone else. After the movie Anthony Mackie answered questions for about 30 minutes about the movie and himself. The movie is about choices you make or you think you make. I really don't want to give it away but it is a cross between being spiritual and really wondering what else is out there. It also makes you think about choices you make in love and how being with a certain person can seriously make you or brake you. Is love worth it? If you knew you would be the greatest person in your area of talent but would just a neighborhood teacher of that talent if you stayed with a certain person, what would you do? Is love everything? I really enjoy movies that make you think and that is exactly what this does. The movie has a strong reference to God and Angels but they call God - The Captain. The Angels are the adjusters. The entire job is to make sure you stay on track and when you don't, that is when they step in. Whether they need to adjust your thought pattern, love or career path, they are always around. It was funny and well as heart clenching. I would see it with your love. If you knew you would be the greatest person in your area of talent but would just a neighborhood teacher of that talent if you stayed with a certain person, what would you do? All good business women need a Pre-nuptial agreement! The title of today's blog was a comment that was given by the Real Housewives of Atlanta, Phadrea. Phadrea is a well known attorney in the Atlanta area and commented that she has a pre-nup and all good business women should. Cynthia (another castmate) who recently got married on the show also has one. Do you feel its necessary to get a pre-nuptial agreement in 2011. Personally, I do. Especially if you are a celebrity or very wealthy. I say that because for some reason celebrity marriages have a 2-5 year shelf life no matter how much in love the couple starts out to be. And a good friend made a great comment, "I would not want to sell inherited land just to pay you half!" If you get divorced, what was acquired during the marriage should definitely be split, but if I had it before the marriage (money, land, assets) I wouldn't want to just give that over freely if we didn't work out. Do I have a pre-nup? Ummm, no. It really didn't cross my mind because at the time I was young and didn't have really major assets. I did have a rental property but my soon to be husband was a realtor so I knew we would acquire more properties together. Honestly, when we got married, we didn't have much to get a pre-nup for!! So if the unthinkable ever does happen, I am going for half to be fair because we would have built this empire together. But, I am really not trying to get divorced. One last thing, I do not believe getting a pre-nuptial agreement is saying you are expecting your marriage to fail. I believe its saying that in a society where 50% or more of marriages now end in divorce - you are protecting yourself against the odds. Just my thoughts, feel free to share your own. 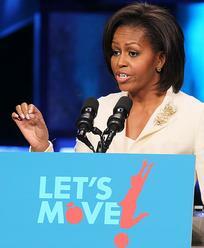 First Lady Michelle Obama Visit Atlanta!! Speaking against childhood obesity! Photo by Phil Skinner First lady Michelle Obama made Georgia her prime stop Wednesday to celebrate the first anniversary of her "Let's Move" campaign aimed at improving children's health. "It's a conversation about what our kids eat and how active they are," Obama told parents and community leaders at North Point Community Church in Alpharetta, one of two stops she made in metro Atlanta. "About how they feel about themselves. And about what that means, not just their physical and emotional health, but for their success in school and in life. "Obama's trip to Georgia was not accidental. Georgia has the second-highest rate of childhood obesity in the United States. Nearly one in three children ages 10 to 17 in Georgia are considered to be overweight or obese, according to the 2007 National Survey of Children's Health, likely because of a combination of poor nutrition and lack of physical activity, and influenced by societal factors including family dynamics, school systems and societal norms. In turn, childhood obesity can lead to diabetes, high cholesterol and other potentially deadly problems. What do you think about childhood obesity? Is it the schools fault or is it the parents fault? It's definitely not the child's fault. They eat what they given to eat. It is our responsibility as a parent to make sure our children are eating healthy. I understand that healthy food is not cheap. I understand that sometimes healthy food is not the quickest thing to make, but that's still an excuse. Does that mean you should always give your child hamburgers and french fries because that's what is in the neighborhood? I really believe where there is a will, there is a way. And just like you pick up a bag of processed chips, you could choose to pick up bananas. Your choice. It's so much better to prevent a problem rather than trying to solve it once it happens! Make healthy choices for your entire family. To that end, Obama unveiled a public service campaign to provide parents and families information on healthy food and physical activity. She spent the early afternoon at Atlanta Public School's Burgess-Peterson Academy handing out snacks of fresh blueberries and touring the East Atlanta school's organic garden. Jumpoffs GONE WILD! Why do Men feel the need to even have a jumpoff? I read different media outlets from time to time and it never fails that it's at least one story about a jumpoff "mistress" ready to tell it all. Why do men need a jumpoff anyway? It seems that more and more Celebrity Jumpoffs are willing to tell everything that happen between them and their celebrity lover. Just yesterday, the alleged jumpoff of Carmelo Anthony is now writing a tell all book. It seems that every time you look up, a lady that has been sleeping with a married NBA or NFL player, actor or rapper is shouting from the roof top, "I did it! I slept with him! Look at me! Listen to the details!" My question is, didn't you know when you started sleeping with him that you were the other woman? I am sure you did. Was is something that he didn't give you or did you end up falling hard for him and when he finally wouldn't leave his wife - you decided to let the world know? I am not condoning having a jumpoff or mistress by any means, but if you are going to be one - know your part! You are the side piece not the main piece and why is it so important to tell everybody your own personal business. You are hurting his wife and his family. It's one thing to have a personal conversation with his wife but why release pictures, text, and detailed stories for the world to see. What do they gain by doing that? Unless, it was a game from the beginning. My other question is, why do so many celebrity men have mistresses! What's so funny is that men still haven't learned. They more you have, the more you have to lose and yet men keep putting their families, health and futures at risk. If you want to have other women, why even get married. Just be single and play the field. Why get married and then still sleep with women. Is it for an image? Forget an image, just be you. Be open about being a ladies man versus being caught as a cheater and let your domestic issues play out in the media. The SWAP was a success! 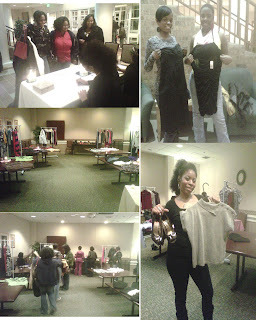 It was alot of fun for me and my friend, Teresa, who put the event together. The actual drop off period was from 6pm to 7pm and we started swapping around 7:15pm. 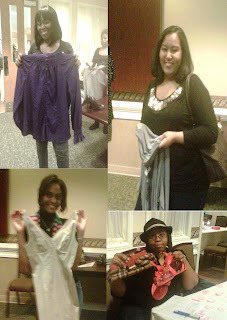 While at the swap, the participants only had nice things to say about the venue, decorations, and how we conducted the swap. Many of the women had never been to a fashion swap before and expressed they really enjoyed the experience. 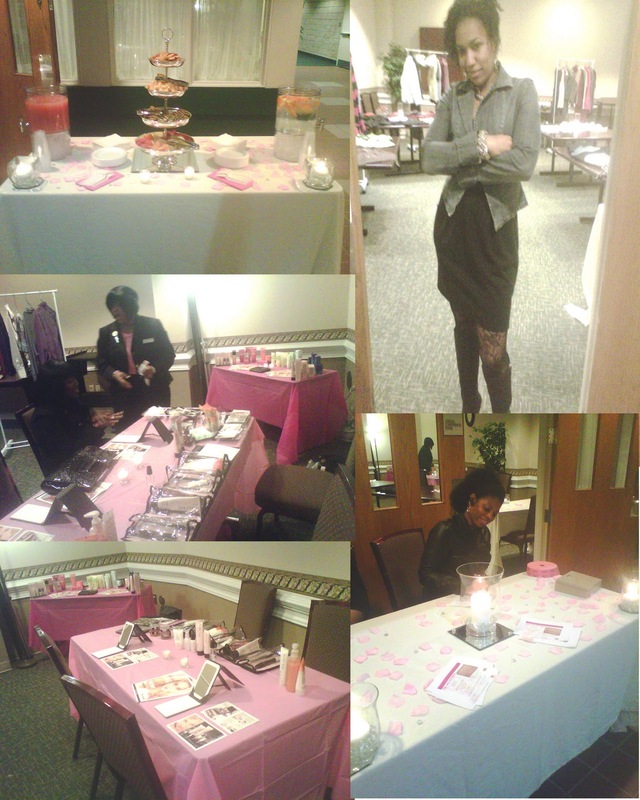 While we were separating the items, the women enjoyed Mary Kay treatments and refreshments. It was our first time actually putting together something like this and in my opinion it went very well. I look forward to doing another event very soon. We are discussing a kids swap next month now. I am very thankful to the people that did come out and support me (us) with this event. While we were setting up the event, a young lady booked Teresa & I to host a swap for her organization in April. It will be a Charity Event for homeless mothers. People will come and SWAP and donate a dress for the mothers in this shelter for Mothers Day. I think it's a great cause and I am excited to be apart of it. Here are a few pictures from the SWAP-TASTICS! BUT BUT BUT for as many women that are going natural, there are still women that love their relaxers! This blog entry is not to bash them but inquire WHY? Why do you still get a relaxer? Have you ever tried not getting a relaxer for at least 6 months, a year or longer? Were you ever natural and went back to a relaxer? Are you scared to try being natural? Or are you just plain happy having a relaxer? I was able to attend the Mo'Nique Show taping yesterday (I will also be on the first 5 minutes of the show playing her Black History Game next week) Bria Murphy (daughter of Eddie and Nicole Murphy) was a guest. Bria is now the spokesperson for Dark & Lovely Products! She also gave everyone in the audience the New Dark & Lovely Healthy Gloss 5 Relaxer. The five signs of healthy hair are moisture, shine, strength, softness and body! Well, I don't need the relaxer. I wanted to do a give-a-way for my Facebook Friends and Blog Friends! All you have to do is comment on why you LIKE GETTING A RELAXER! We will go over the comments and choose the best one. The winner will be shipped the new relaxer and picture posted on the blog! Please don't forget to LIKE the Facebook Page as well. Thanks soooooooooooo much! We look forward to reading your comments!